Published Jan. 21, 2013 by Imperial Beach Patch. Inaccurate data led to Imperial Beach losing a $500,000 grant to improve access to the Bayshore Bikeway near the yet­-to-­be-­built Bikeway Village, SANDAG stated in a Jan. 11 report. The money would have been used to construct parking, a bike lane and boardwalk along 13th Street and around the Bikeway Village and next to the Bayshore Bikeway. Scores were assigned to 51 grant applications from cities around San Diego vying for 2012 Active Transportation grant money by the planning agency’s staff. Two mistakes were made when analyzing the Bayshore Bikeway improved access grant, said Charles “Muggs” Stoll, Director of Land Use and Transportation for SANDAG. The Bikeway Village was inaccurately considered at a distance instead of next to the Bayshore Bikeway, and some numbers were put in the wrong place on tables made to tally final scores. As a result, the Imperial Beach project and another in National City were originally disqualified but later found to be sufficient to receive funding. A Carlsbad Coastal Rail trail project also should have received an additional $50,000, the staff report said. Another bike development in IB did go forward with $1.5 million in grant money. Scheduled to be completed in June, the Eco Route Bikeway will bring bicyclists from the Bayshore Bikeway and 7th Street to Palm Avenue. Palm Avenue from 3rd to 7th streets will be reduced to one lane in each direction. Had the Bikeway Village grant been issued, the Eco Route Bikeway would have only received $750,000 in funding, Stoll said. National City received funding for two of three grant projects, and Imperial Beach did pretty well to receive $1.5 million of a total $8.8 million doled out to 2012 Active Transportation grant program projects, Stoll said, but that doesn’t make up for the mistakes. “That doesn’t excuse it. Making errors like this are completely unacceptable to us, but by the time it was recognized, people were already putting forward the dollars they were awarded,” he said. Since many of the 25 different projects approved by the SANDAG board last September have already moved forward, no changes in funding will be made, Stoll said. In the wake of the error, grants will go through additional stages of review in the future, the staff report said. “It’s a shame that projects that should have received funding lost out in this process that is needlessly competitive when it should be placed at a priority above and beyond all the unnecessary freeway widening plans that SANDAG has in store for us,” BikeSD.org said on its website. The Bikeway Village, a development to remodel two warehouses on 13th Street with shops, other businesses and possibly a hostel, is currently in limbo, waiting for action by the state to move forward. Following actions to dissolve redevelopment agencies, $2.2 million promised to the project by the Imperial Beach Redevelopment Agency Successor Agency needs approval from the California Department of Finance. The DOF may decide if funding can be used for the project as early as April, said Assistant City Manager Greg Wade. 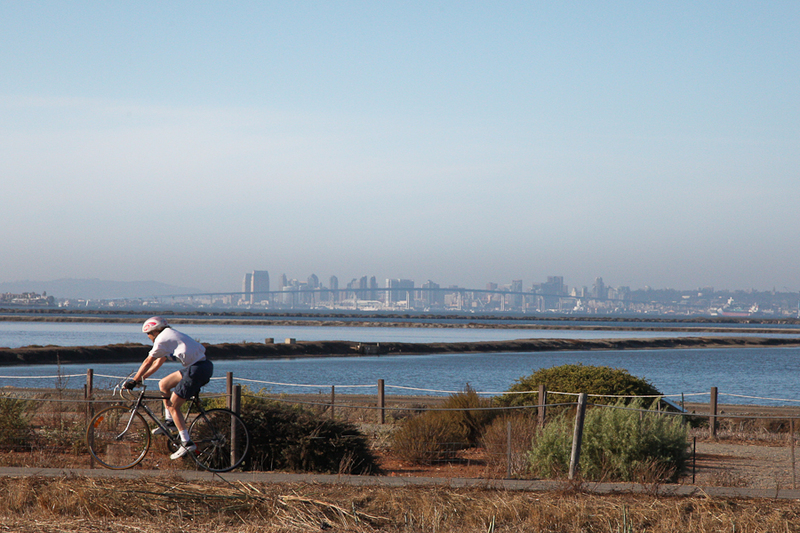 The Bikeway Village also awaits approval from the California Coastal Commission. Rex Butler, owner of the warehouses and Bikeway Village LLC, could not be reached for comment. This entry was posted on Saturday, February 8th, 2014 at 2:22 am. It is filed under Story Archive and tagged with Bayshore Bikeway, business, government, Imperial Beach City Council, Imperial Beach Patch. You can follow any responses to this entry through the RSS 2.0 feed.